There are some adages in professional sports that have stood the test of time. Perhaps, one of the truest of these is that big-time players play big in playoff games. For the Tampa Bay Lightning, you would be hard-pressed to find a player that has elevated his regular season performance during the playoffs more than Alex Killorn. Sure, an argument can be made for Tyler Johnson who seemed to take the NHL by storm during the Lightning playoff run that saw the team lose to the Chicago Blackhawks in the Stanley Cup Final in 2015. But Killorn has been right there with Johnson in terms of stepping up during the games that matter most. To know that during his regular season career that spans 272 games and parts of four seasons, Killorn averages a half point a game. In the postseason, he raises that production up over 40% to produce .71 points per game. When the games count the most, when the engravers are sharpening their tools, Killorn amps up his play to produce more. He plays big in big games. This isn’t to say that Killorn is a slouch during the regular season. In the three and a half seasons Killorn has played with the Lightning he produces 41 points for every 82 regular season games. That is a strong and consistent performance for a guy who has primarily played third line minutes. Yet when the playoffs begin, Killorn amps it up quite a bit and his play forces people to take notice. Not too many players in this league can raise their personal standard as much as Killorn has done over the last two post-seasons. 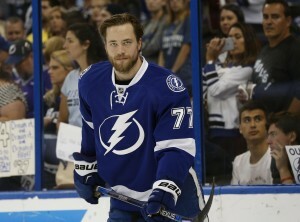 Perhaps, that is why during a summer when Lightning general manager Steve Yzerman had some noteworthy names on the team’s free agent list to address, after Steven Stamkos and Victor Hedman, Killorn received the longest contract with his seven-year, $31.15 million dollar deal. This list of Lightning free agents included some names like Andrei Vasilevskiy and Nikita Kucherov and yet it was Killorn who received a longer term deal than those two. The length of his new deal should tell Tampa fans how integral a forward Killorn is in the plan of the franchise. This deal is just a reward for Killorn and the consistency, especially in the playoffs, he was produced for the team. The potential hazard in this deal for Killorn is the expectations that come with this significant contract. 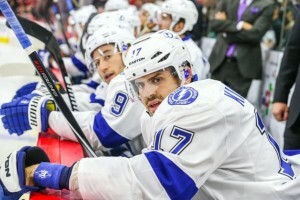 As the new season has begun, Killorn finds himself with two-thirds of the Triplets line from the last couple of seasons. Lined up with Johnson and Nikita Kucherov, Killorn has replaced Ondrej Palat on the Trips and has scored four goals in the team’s first five games. Not that he will maintain this torrid pace, but the first handful of games has shown just what Killorn can do as a top-six forward playing on a line with two all-stars. This should be the regular season where Killorn finally matches his playoff production. Playing with the likes of Johnson and Kucherov, who both possess strong offensive skills, should keep Killorn’s production at or near the team lead. The team’s top line features Stamkos and Jonathan Drouin. This is the line that opposing coaches plan to stop. Should the Johnson-Killorn-Kucherov line match the top line’s point production, it makes playing Tampa just that much harder. Fans will be looking for Killorn to score more than his average of 15 goals and 24 assists. That is what he has done over the last three full seasons for the Lightning. Barring any long-term injury and maintaining his second line minutes should provide the opportunity for Killorn to set career highs this year. If Killorn isn’t putting that level of expectation upon himself, then he wouldn’t be the player that Yzerman thought when he offered the player his new deal. One thing for certain is that in his six years as the Lightning GM, Yzerman has proven adept at judging not only talent but the character of his players. It wouldn’t be all that surprising to know that since taking over the reins of the personnel for this organization, Yzerman only has two major players remaining from the team he inherited back in 2010. Stamkos and Hedman. Cornerstones of this franchise. But every franchise that puts itself into contention for Lord Stanley’s Cup has to have more than two franchise players. Killorn fits that mold. Along with guys like Johnson, Palat, Kucherov and Drouin, Killorn brings another weapon to this team that their opponents must contend with to have a hope of taking this team down. The good news for the Tampa faithful is that Killorn, at 27 years-old, is just coming into his prime performance years. Starting and playing this year on the second line will prove to fit him like a glove. We’ll still get to see Killer playing hard on the forecheck. Doing all the things on the second line that he learned playing third line minutes that focused more on the defensive aspects of the game. Now on the second line, we will get to see Killorn’s offensive game. So far this season, the early returns are in and are very positive. Will this continue? Too soon to say, but it looks good now. As the season continues, Lighting Nation will understand why Yzerman thought enough of this young man to lock him up as a player longer than anyone but the team’s two cornerstones.